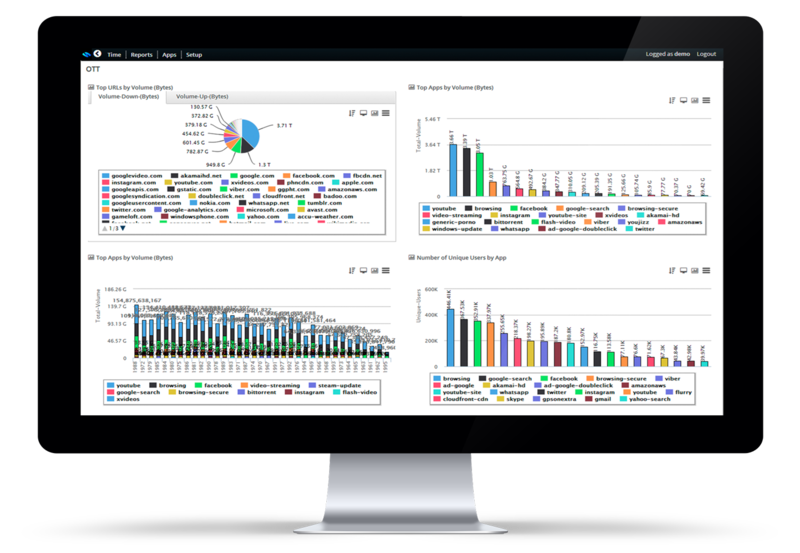 Viewtisight is the business intelligence system that will provide all the reporting via an easy to use graphical user interface. It can collect and correlate data from any third party, Netflow, syslog, geolocation, etc. 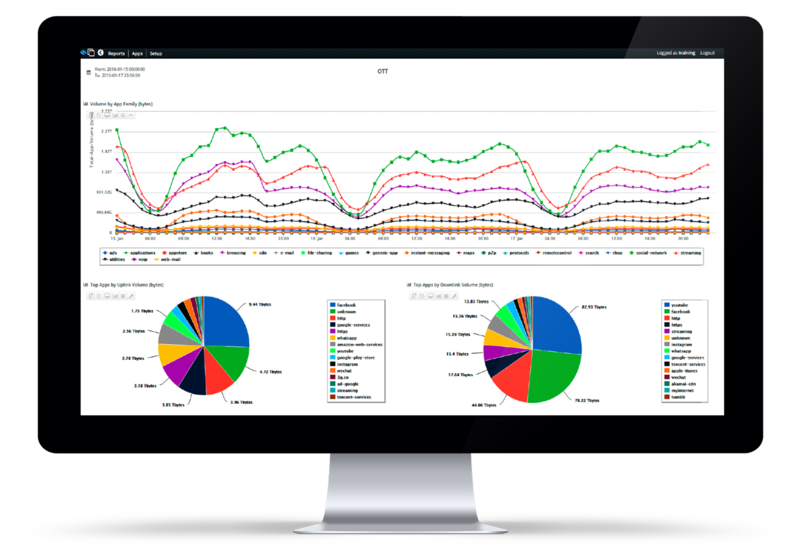 It is easy to deploy and has a complete set of out of the box and personalized dashboards. Viewtisight can be installed in any virtual environment, both public and private cloud. Viewtinet also provides the optimized pre-installed Hw appliance to be installed on premises. Schema-less columnar store (Vmstore). This is a BigData schema-less distributed columnar store which is used for storing data and correlate it in near real-time. The fact of being a schema-less and columnar store allows for new data sources and columns to be added very easily, unlike traditional relational databases. Streaming Dataflow engine. This engine is responsible for parallelizing the different tasks and make them run using all the available hardware. Dataflows take streaming data and transform it, correlate it and store it depending on the application to be performed. The streaming dataflow engine is used to implement the Complex Event Processing engine inside ViewtiSight. X86 and Linux. This platform is executed on top of inexpensive x86 Linux servers, in pizza boxes, blade servers or virtualized. Storage is achieved by using the directly attached server storage distributed via HDFS. Telco & Enterprises IT Collectors. A wide library of collectors are available off-the-shelf for the most common Telco and enterprises IT data sources. Besides, thanks to its SDK, it is possible to quickly develop new data sources in case it is required. Multi-dimensional user insight. Having the ability to cross-correlate information from different data sources and combine all the dimensions, makes it possible to distill actionable user insight. Self-learning algorithms. ViewtiSight provides auto-discovery and self-learning features that allow the system to discover new network elements, forecast the behavior and detect problems without human intervention. Provisioning is greatly reduced and almost near-zero administration is required. Google-like search and reporting. ViewtiSight provides a very simple web interface inspired by the most popular search engines, which makes it very attractive for people to use it without having to understand underlying data models. This interface is called NetSearch. Out-of-the-box applications. Thanks to the openness of ViewtiSight, several out-of-the box applications are provided to cover different needs in Operators (e.g. customer experience, network intelligence, customer intelligence, log retention, network monitoring, etc). This makes the ViewtiSight product suite unique in its approach as it covers all the process from the collection to the analytics and actuation processes. Low TCO. The previous software and hardware combination makes it possible to have a lower TCO as compared to other legacy solutions. Viewtimon acts as a probe capable to see real time traffic and generate the most accurate information related to the quality of experience, user awareness and application recognition. It can be implemented either virtual or physical with a range of Viewtinet Viewtimon certified appliances that can cover up to 100Gbps of traffic. The layer 7 recognition is based on machine learning and can detect over 10,000 applications in real time. Being connected to real traffic, Viewtinet can provide very detailed information about the quality of experience, video resolution, devices etc. Using the Viewtisight interface and its drill-down capabilities it is the perfect match for easy KPI’s indicators.